If 80% of current Internet users have looked for health information online, what does the future hold? Will the other 20% of current Internet users try a health search some day? Will the 40% of Americans who do not have Internet access some day go online and conduct health research? There is evidence that most Americans, whether they currently have Internet access or not, have a positive outlook when it comes to searching online for health information. We also notice that the more familiar someone is with the Internet, the higher his or her expectations are about online health information. However, there is a significant group of Americans who are completely cut off from online health resources. 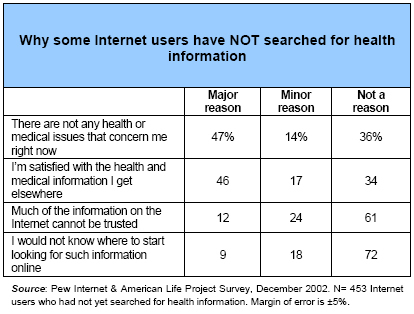 Those Internet users who have not yet searched for health information online are most likely to say they just don’t have any medical concerns right now or they are satisfied with the information they get elsewhere. They do not seem daunted by the possibility of untrustworthy information or concerned about where they would start looking for health information online. New Internet users, and even some non-users, view online health resources in a positive light. Another respondent happened to be answering our survey on the day of her very first health search. “I took my son to a children’s neurologist today for the first time. He says my son has short adult syndrome,” she wrote. “This is my first time using the Internet to research an illness.” Her approach was typical of a new health seeker – she just typed “child neurology” into a search engine and began reading, but unfortunately had not yet found any relevant information. In a September 2002 survey, we asked all Americans if they would expect to find reliable health information online.33 Eighty-one percent of current Internet users were confident that they could find good health information on the Internet. But a surprising 45% of non-Internet users said they also would expect to get reliable information about health or medical conditions online. Most strikingly, Internet users are about as likely to say they will go online the next time they need medical information as they are to contact a medical professional. 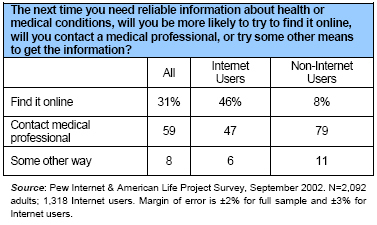 Nearly half (46%) of Internet users say they will use the Internet next time they need reliable health care information. This is statistically the same as the 47% of Internet users who say they will contact a medical professional. Internet users who have already searched for health information are especially enthusiastic – fully 58% of health seekers say they will first go online when they next need reliable health care information; 35% say their first move would be to contact a medical professional. And, in another sign that there is potential for growth in the health seeker population, about one in twelve non-Internet users – 8% – say they will turn to the Internet first when they next need medical information. Those users will probably turn to a trusted friend or family member with online access for this information. And if they eventually do go online, health information will probably be a popular pursuit for those non-users who are already enthusiastic about e-health resources. As noted above, the Internet population is holding steady at about 60% of American adults. However, of the 40% of Americans who describe themselves as non-Internet users, many in fact have some direct experience with using the Internet and have dropped off. Others live in homes that have Internet connections and are literally offline in an online home. Still other “non-users” find ways to exploit the technology by getting family and friends to send and receive emails for them and do information searches online, even though they themselves remain offline. Thus, when the number of those who live in wired homes and the number of Internet dropouts are considered, the actual size of the population of Americans who have never had any tie – formal or informal – to the Internet is about 24% of Americans. These people are generally the poorer, older segment of the not-online population, and are more likely to be white, female, retired and to live in rural areas.34 It is these Americans who are least likely to have access to any online health information. By contrast, the 60% of Americans who do go online are gaining confidence with each passing month. As more users become “veterans,” with three or more years of experience, they are more likely to turn to the Internet if they have a health question. Resources are often hidden in plain sight. Respondents to our online survey praised the special qualities of the Internet as attractions for new users – one wrote that “anonymity is helpful,” and another wrote, “I can be me without the trappings.” A particularly poignant response came from a respondent who can no longer speak, so the Internet has become a lifeline. But when asked if there has been anything that they wanted to do using online health resources that they have not been able to do, a popular suggestion was to provide free access to medical journals, most of which are currently available only to subscribers or to those able to pay a fee. The “invisible Web”35 is truly invisible to many e-patients – search engines cannot gain access to certain pages and online databases that contain vital information. Unfortunately, respondents also listed resources that do exist on the Internet, such as a glossary of medical terms or lists of clinical trials, but they just have not been able to find them. Many e-patients wished for “better search engines” or, more generally, “a better way to search for information” since they find most sites accidentally and have no clear way to “save” the searches. Harris Interactive’s study on behalf of First Health Group Corporation found that consumers see both benefits and drawbacks in health technology.37 About six in ten consumers agree that information technology will give them a sense of control and empowerment in managing their health. And another 63% believe information technology will save them from making unnecessary visits to the doctor. But about half of consumers say that new information technology will end up being more trouble than doing things the old way. And the majority (77%) believes that doctors will miss subtle clues in online interactions that they would catch in office visits.